IRON MAIDEN – Countdown Till Release Of New Single “Speed Of Light” On Friday!! 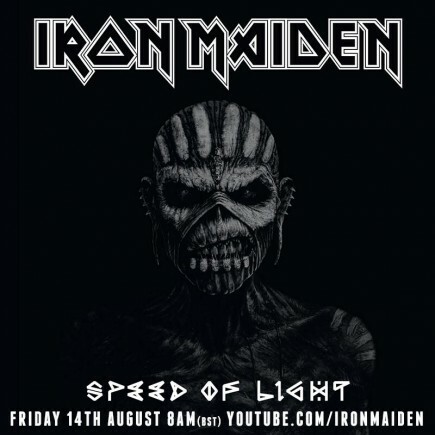 On Friday, August 14th, the new IRON MAIDEN track in 5 years gets released: Speed Of Light. Click link below for a song snippet! Metal Be Thy Name! 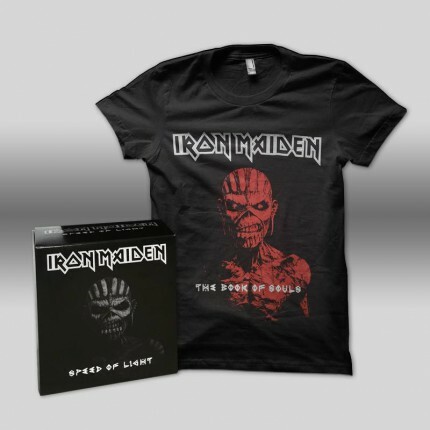 An exclusive Speed Of Light CD single + T-shirt box will be available only at Best Buy starting Friday! This entry was posted on August 13, 2015 at 4:19 pm and is filed under Heavy Metal, Metal, metal music, news, rock music with tags Iron Maiden, Metal, Metal News, metal odyssey, nwobhm. You can follow any responses to this entry through the RSS 2.0 feed. You can leave a response, or trackback from your own site. Hell yeah! Cannot wait for this \m/. Hey Stone been meaning to tell you this for ages but since I went to see Ann Boleyn at that Jam Night in LA all those months ago, I have become a regular there each week. It just kept on getting better and better. Thanks again for the heads up back then! Aw, man, Deano! That is terrific news!! I am so psyched that all worked out this way for you, man! Believe me, I see what that crowd of Metal Warriors are up to and they must be putting on quite a show time and again! I wish it was all near me! Aaahhhh!! LOL! Cannot beat LA in that regard. So many live here. The Anthrax show at the Hollywood HOB before they started to tear it down was epic!